Tom Hayes, center, has received the “Spirit of Asbury Park” Carousel Award. This year’s Asbury Park Chamber of Commerce “Spirit of Asbury Park” Carousel Award is being presented jointly to Tom Hayes of New Jersey Natural Gas Company and Townsquare Media, owners of WJLK-FM, better known as “94-3 The Point” and NJ 101.5 FM. The two companies share the broadcast studio on the Asbury Park boardwalk where the radio stations broadcast on Fridays and weekends from Memorial Day to Labor Day. Hayes said the collaboration began in 2014 and will begin its sixth season this Memorial Day. The trailer/studio had been the Chamber of Commerce Visitor’s Center. When Townsquare approached the company about sponsorship, Hayes said there was one important consideration – it had to be a way for New Jersey Natural Gas to promote the non-profits it helps during the year. 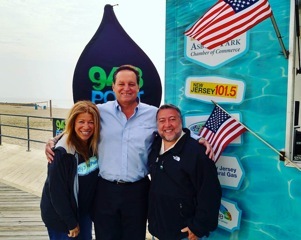 As a result, someone from one of the non-profits appears every Friday with The Point’s “Lou and Liz in the Morning.” Various other personalities from The Point and NJ101.5 also broadcast from the boardwalk studio throughout the weekend. Hayes said he’s especially honored to receive the “Spirit of Asbury Park Award” as it has been named for Joan Flatley, who was executive director of the chamber when Hayes was president from 1995-2000. They were tough times for the chamber and the city. Hayes said things were so bad they organized a bus tour of the city to encourage business people from New York to show them what was here. Don Lass, then editor of the Asbury Park Press at the time came on board and arranged for a bus and the response to the “SoHo by the Sea” tour attracted so many people they had to get a second bus. Hayes is a 30-year employee of the New Jersey Natural Gas Co.and was hired as Facilities Manager. He has a degree in architecture and became Director of Economic Development. When the company moved to new headquarters in Wall, they kept an office in Asbury Park at 601 Bangs Ave., the company’s old HQ and opened a Community Room for meetings and other events to be sure they had a presence in the city. There is still an office in Asbury Park on Lake Avenue inside the Shoppes at the Arcade. In the mid-1990’s, Tom Hayes an his wife, Regina, gambled on the city’s future and bought the Crane House at 508 Fourth Ave. which was scheduled for demolition. Once the boyhood home of author Stephen Crane, the house had fallen into disrepair and Hayes feared it was a bit of history being lost. He purchased the house saving it from demolition and helped start the Crane House restoration. It is now owned by the Asbury Park Historical Society. Hayes and Townsquare Media will receive their Carousel Awards on Friday, May 10 at Asbury Park’s Historic Convention Hall. Tickets for the Awards Gala are $160, Black Tie optional. Tickets and sponsorship information are available on line at www.CarouselAwards.com or by phone at 732-775-7676.